A couple gives their home An elegant update that preserves their traditional aesthetic. any homeowner who has experienced a flood or leak can tell you: even a small amount of water can do major damage. For this traditional home in a traditional neighborhood, water damage compelled a renovation, and the adage proved true: necessity is the mother of invention. To reinvent the space, interior designer Amy Vermillion of Amy Vermillion Interiors worked with John Bourgeois and Mac McGinn of Bourgeois McGinn Builders to create a beautiful, problem-solving space — from rethinking the floor plan to adding innovative storage. The goal? New spaces that are as welcoming as they are functional. “You want the design to draw you through the house,” McGinn says. 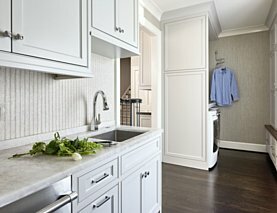 The team started with the floor plan, thickening the wall between the kitchen and the dining room to create a bar, absorbing a powder room to create a multifunctional mudroom-meets-laundry-meets-prep space, and reconfiguring the kitchen layout to maximize its best features and create a better flow. In the kitchen, Vermillion chose champagne quartzite for its durability, beauty, and utility, using it for the countertops and a ceiling-height backsplash. “The walls are stone all the way up around the windows. It just gives it that clean look,” Vermillion says. “You can roll out dough right on the stone.” Knowing that the homeowners would want to do just that is one of Vermillion’s hallmarks. She pays attention to the tiniest details, from ensuring a favorite platter has the perfect storage spot to the specific ways her clients will use a space. “With every project we do, we get right up in the client’s business,” Vermillion says. “Do you bake? Are there small children setting the table? Do you entertain? Casually or formally? All this stuff, we want to know about.” The light quartzite sets off the large, steel windows, which replaced the existing, smaller windows to let in more natural light and maximize views. “The windows play a really big part in [the transformation of the kitchen],” McGinn says. “There’s an amazing view of a patio and pool back there,” Vermillion says. Adding larger windows meant losing some wall space for upper cabinets, so Vermillion, McGinn, and Bourgeois added storage everywhere they could. All of the cabinetry was painted in a custom color Vermillion designed just for this space. 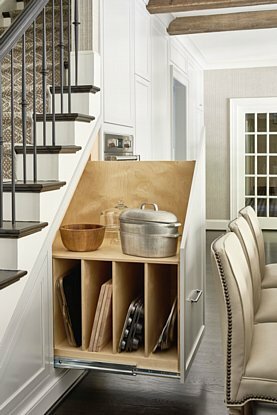 And there are custom cabinets under the stairs, including a cabinet that rolls out about three feet. Antique beams from Lynchburg, Virginia lend gravitas to the otherwise-airy kitchen. 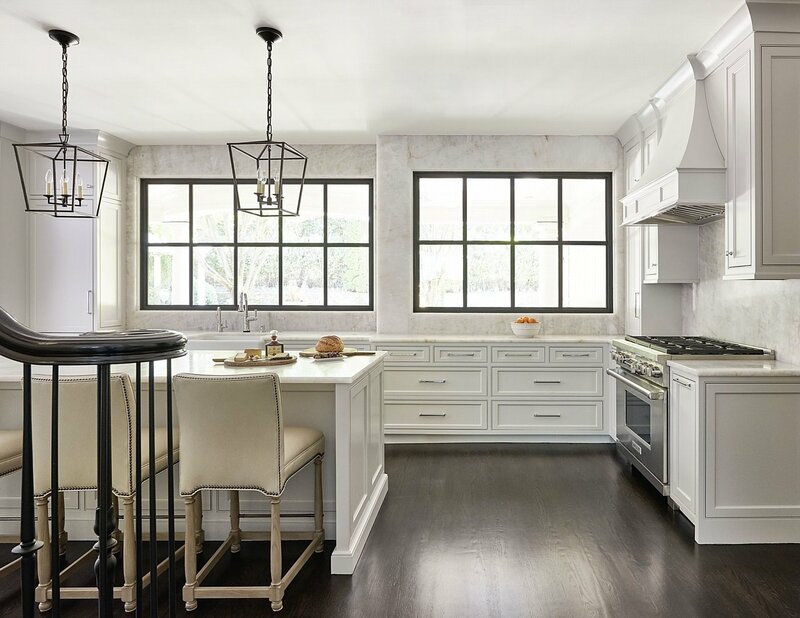 “They’re century-old, hand-hewn oak beams,” McGinn says, adding that they had to be milled down to precise new specifications because of the kitchen’s height limitations. The original oak flooring, which was sanded down and given a new, dark stain, grounds the space. we took part of that for a new mudroom/laundry/prep space,” Vermillion says. Now the homeowners have a place to stow their small appliances and electronics, do their laundry, and have more counter space for prep work when they’re hosting dinner guests. On the other side of the kitchen, the renovated formal dining room and new bar are also full of inventive design features. One of Vermillion’s favorite features of the renovated dining room are the recessed cabinets on one wall. 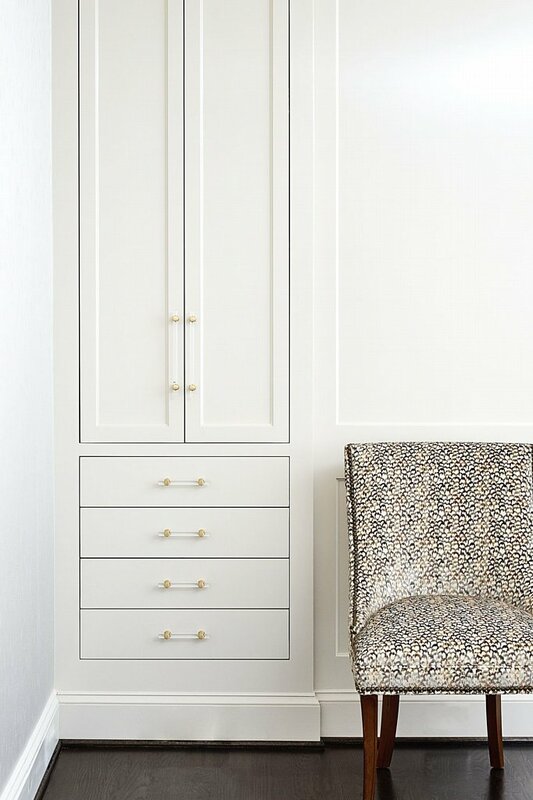 Although this type of storage in a dining room isn’t a new concept, it gives the feel of a historic home but modernized with Lucite-and-brass handles and painted in a semihigh gloss. “The drawers are for linens, etcetera,” Vermillion says. 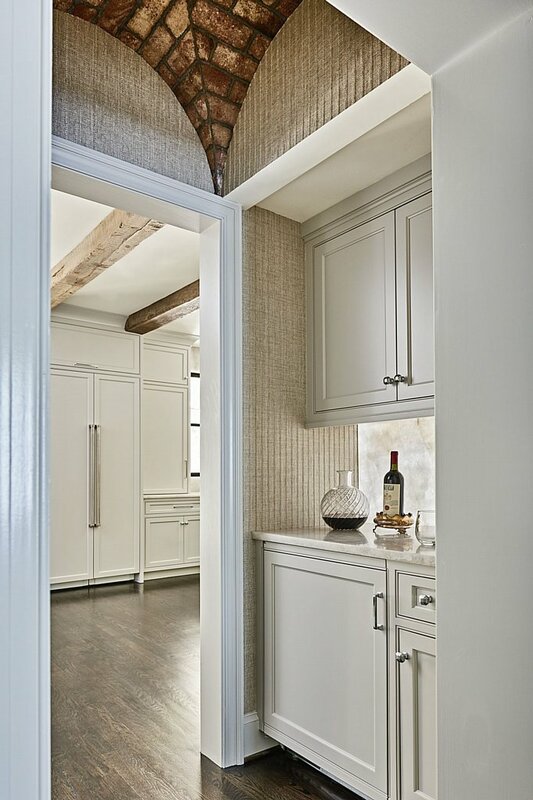 “It’s a new-old idea.” Built into the nook that was created in the thickened wall between the kitchen and dining room, the bar area unites the look and feel of the newly renovated rooms while adding utility that didn’t previously exist. The small-but-mighty space includes an icemaker, a beverage center, bottle storage, and a piece of the same champagne quartzite from the kitchen. On the ceiling, a groin vault built with antique brick—and inspired by one of Vermillion’s client’s homes on Kiawah Island, South Carolina— gives the space a hint of old Lowcountry flair.